On a balmy, spring evening in May of 1991, we discovered Piazza San Marco for the first time. The bands were playing on both sides of the piazza. Waiters glided from table to table. The passing crowd swirled and flowed en masse, like the foam of a gigantic tide pool. The briny air, given life by the day's heat, was now aloft with a gentle breeze. The piazza seemed lit from within with the spontaneity and glow of an impressionistic painting. This first night has been forever frozen in my mind, and it shall never change. This is how I will forever remember Piazza San Marco. Our past few visits to Venice have been in winter when all is different. The great piazza is cold and wet and often empty. The tables and chairs and bandstands are replaced by the scaffolding and planks that create an elevated walkway for acqua alta, the Venetian high tides that turn Piazza San Marco into a wading pool. The light is low and anemic. Even the pigeons have deserted the place. Piazza San Marco, at its worst, and even sometimes in winter, is filled with day-trippers who attract tacky souvenir stands and leave behind garbage. Tour groups travel in bug-like swarms in and out of the basilica and then swirl around the piazza only to dissipate an hour or two later. At its worst, it is barely tolerable, a poster child of how unbridled tourism can destroy a place, no matter how beautiful it might be. At its best, it is—as Napoleon once said—the drawing room of Europe, the grandest public space on earth. It is the place where Katherine Hepburn (in Summertime) finds romance on a hot, summer night. It is cinematic and unapologetic in its romance. It makes one swoon. It makes one forget the finicky crowds and glittery knickknacks. Nothing has changed since Summertime was filmed. The piazza is the same. And to this day, the band still plays the same song that they played for Hepburn on the night when Rossano Brazzi glides into her heart. Yet, winter brings sadness to Piazza San Marco. The bands are silent. The shopkeepers are on edge from the ruinous waters of acqua alta. The sun, in its low arc, barely reaches the piazza at all. The winter cold and rain chill to the bone in that is hard to described. Venice is a city of stone and fog. Its cold, damp air grips one like the bony hands of the grim reaper. It does not let go. 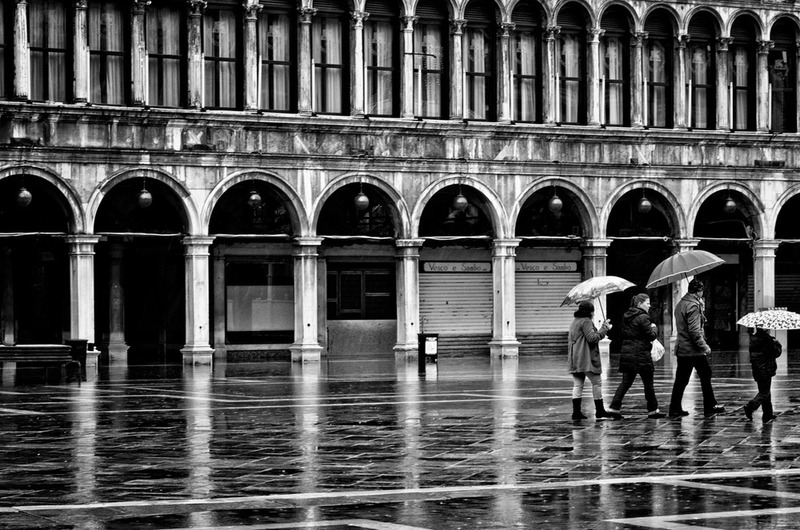 On Christmas day I stood in the middle of a rainy and deserted Piazza San Marco. An acqua alta had just subsided. The elevated walkways were still in place. Much of the piazza was scaffolded and under restoration. It was cold and rainy. My memories flirted with the first moments I ever saw this place on that warm, May night. On that first, flirtatious moment I was enthralled, enchanted, and utterly in love with Venice and its great drawing room. On this winter day it looked so different yet the distant echoes of Katherine Hepburn's song played in my head. Suddenly the trance was broken as the wind caught the rain and sent it into my face. I shivered as a family of four and their umbrellas passed by me. The air was cold and silent. There would be no band on this Christmas day. This was not the Piazza San Marco of my dreams. But, it was Piazza San Marco all the same. Like catching a Hollywood starlet without her makeup, I was at the piazza on an off day. But, I had her all to myself and, for that, I was grateful. Piazza San Marco, on her worst day, is still the place of my favorite dreams.